It’s the time of year for boxelder bugs! Great information from Elizabeth Killinger, UNL Extension Educator in the following post. 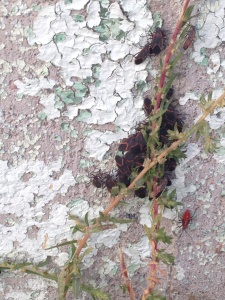 Boxelder bugs gathered together on a home’s foundation. Daylight Savings time is ending and it is time to ‘fall back’ once again. Fall brings about cooler temperatures, changing leaves, and boxelder bugs by the millions. Find out what you can do to help keep these pests from invading your home.